Myne Whitman Writes: All Thing Fab - FabXchange Forum and Fabulosity Galore! All Thing Fab - FabXchange Forum and Fabulosity Galore! Anyways, I've previouly told you about the FabXchange swap events in London. The fab duo are now moving their success online in order to reach more people. Fashionistas can now swap and giveaway fashion items such as clothes, shoes, bags, accessories including books to other fashionistas on the FabXchange Online Swap forum from the comfort of their homes. The FabXchange Online swap forum kicked off on the 21st of November 2011 and already boasts a growing customer base. The online forum gives its members a wider base of fashionistas to swap with and can take part from anywhere and anytime. It allows swaps between members across their country of residence with swappers exchanging fashion items by mail or pick up. Ardent swapaholics like the FabXchange duo can now conveniently and quickly declutter their wardrobes, update tired wardrobes, offload clothes that are hardly worn, save money and give back to the environment. 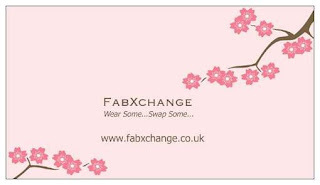 The FabXchange team have definitely upped the feel good factor of swapping by making it so much easier and the best thing about the online swap forum is that it’s absolutely FREE. Your next destination is Fabulosity Galore. This is an online book store created and run by an amazing woman and encourager, Wendy G. Ewurum, of Fabulosity Reads (a book review blog). The store is affiliated to a number of booksellers including Amazon.com and Kalahari..com. Their affiliations are increasing constantly in a quest to find the best book and accessories deals in the market. They also aim to make the best effort to prominently feature books which have been reviewed by Fabulosity Reads . This is to support writer friends in their endeavor to promote and sell their books. Readers are more than welcome to submit their bookish requests and comments to the store. And last but not least writers they also welcome news from writers about any promotional activities concerning works/books. They hope to build incredible and long-lasting relationships with buyers, retailers, authors and publishers and cannot wait to hear from new reders and buyers at the store.